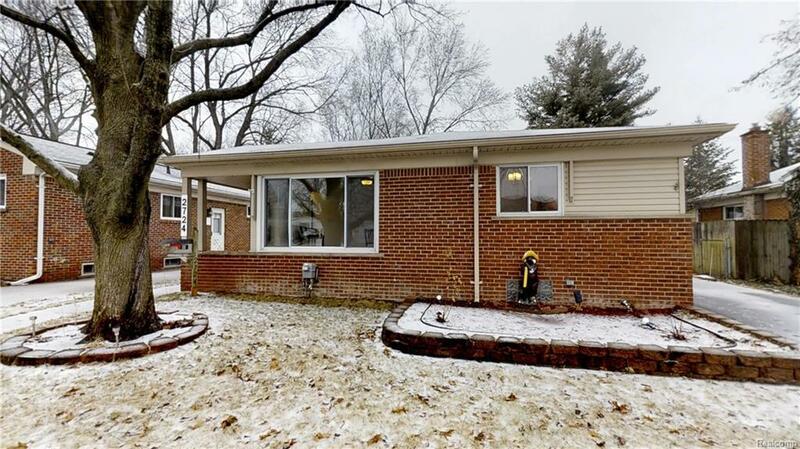 Beautiful, all-brick Spacious Ranch home in the city of Royal Oak. Conveniently located off Oliver street (close to Woodward,696,and I75). Well-maintained home features beautiful hardwood floors and a NEWLY REMODELED KITCHEN. Updates inc. new stainless-steel dishwasher, Stove, SOFT CLOSING cabinets, floors, granite countertops, and fresh paint. Adjacent to the kitchen lies a large, open family room with a great view of the front yard as it is lined with several floor-to-ceiling length windows. Updates to the 1st floor bathroom include fresh paint, floors, vanity, and light fixture. Finished-basement provides a great space for large gatherings. It features several large closets (great for storage! ), washer and dryer (included), and a cozy half bathroom. At the back of the home, is the Florida room overlooking the backyard. This room adds 100 SqFt to total Sq. footage. A large, all-brick detached 2+ car garage with electricity. 5 ZONE SPRINKLE SYSTEM. Check out the Virtual Tour viewing.